A trip across the lake for ice cream… you’d bring your quilt, right? I finished up the binding while on the boat (not recommended! the waves and the speed tend to hinder progress) and so of course had to take the opportunity to get a couple shots while in this tiny little town. I bought 1/4 yard cuts of most of the prints, and then used squares that were 4.5″ for this patchwork quilt (that way I have enough for a second quilt, should I be so inclined!). Since some of the prints are a larger scale print, I did have to cut right through the designs, but I think it’s ok in this type of patchwork – it’s kind of fun to see a slightly different little picture in each of the squares. The back is predominantly pink, with several of the extra squares from the front. I was most pleased that the quilting lines actually go through the diagonal on the squares on the back as well (this of course was not skill, just pure luck!). It’s now been washed and dried and measures 46″ x 52″. Many of you asked about quilting with this fabric since it’s a linen/cotton blend – I found it to be quite similar to the Etsuko Furuya Echino fabrics – it’s a nice weight, not too heavy, and I think it gives the quilt a great weight & feel. Since it’s made of a linen blend, it’s not as soft as a regular quilting weight cotton, but I enjoy the texture the linen provides, and I imagine that it would continue to soften up with use and with additional washes. This quilt will be listed in the shop shortly! Sold, thank you! This entry was posted in [search] Charm Quilts, 2010 Finished Quilts, Finished Quilts, Posts about Quilts, Quilts and tagged baby girl, baby quilt, fairytale, far far away 2, handmade, Heather Ross, kona solids, linen, patchwork, quilt, quilting, squares. Bookmark the permalink. tufted tweets in the kitchen! That is a really lovely quilt! I’m waiting for a bundle of Far Far Away 2 to arrive from America, can’t wait. I’d already planned something similar, love the way you used solids in all different colours, I’m now tempted to do the same. Thank you so much for sharing your ideas. Gorgeous colour and pattern combinations! I love it! Nice quilt. I have quilted on a sail boat before but usually we are docked. The quilt is pretty, my favorite shot is the first one while it’s blowing in the wind. Nice shot. Gorgeous! Of course I love the patchwork, and the sort of asymetrical back is great. That first picture of the quilt blowing in the wind is awesome! Love the quilt, but your photos are awesome. Love your backdrops! Looks like Ry is enjoying his kite quilt! Love all of your color choices for the solids – so perfect with Heather’s fairytale fabrics. A boat is the perfect place for the owl and the pussycat! Great quilt and great pictures! Such great pictures!! I love that you take pictures in such awesome and unexpected places. I have to get a little “brave” and get my quilts out in town! I just love all the pics- and the quilt is ah-maze-ing! Your quilt photography is as fabulous as your quilts! It’s beautiful! I love all the solids you incorporated. I’m always dragging my quilts around to finish binding or hand quilting, too. I think my friends are starting to get used to it! That quilt had a mini vacation! Pretty! I always love the backs of your quilts. I LOVE that first picture!! Your photography is amazing! Well at least you didn’t get ice cream on it! 😉 It’s beautiful. Love the quilt and the great backgrounds. Ha ha ha I’m a boat, now that’s going to be stuck in my head! Seriously awesome that you took it over though, great shots of a great quilt! Beautiful! 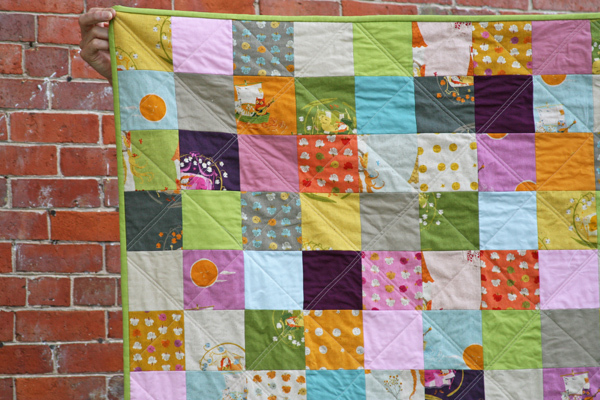 I love the way you carried the patchwork from the front to the pieced backing. I can’t imagine sewing binding on a boat. Sounds like a fun day! 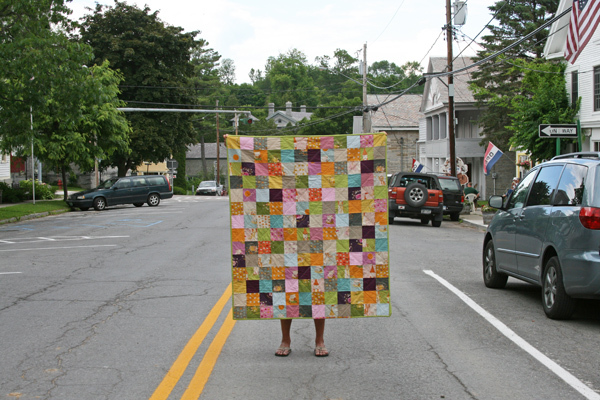 Love the quilt in the middle of the road wearing flip flops! I always love your photos and this series, I must say, takes the cake. It must be fun knowing you and knowing that you might end up spending the day holding up a quilt in random locations. 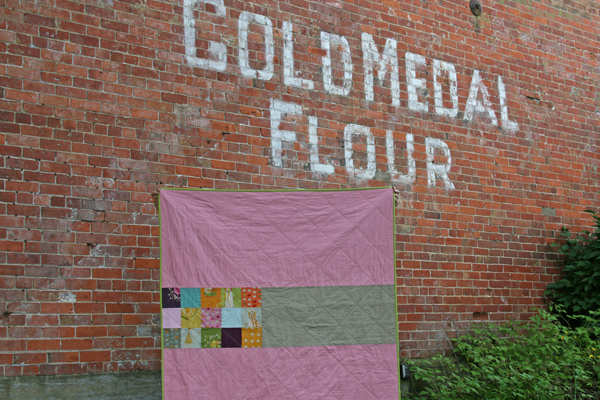 I adore the quilt….but those pictures!! you are making me want to visit Vermont! Love the quilt, love the photos! And your title had me laughing and singing (well, okay, not exactly singing, but you know!)! It’s just gorgeous! Love the quilt. Beautiful quilt! I have to say, yesterday when I first saw that you had a new post, I was excited to see what you had made – but then my computer absolutely refused to load it!!! ARRGGHHHH!! But it was definitely worth the wait…… Great pics, as usual! those photos are fantastic – I just love the one in the middle of the road! One more question… I do not sell my quilts at this time. I can’t seem to have time past making them to GIVE away to friends and family. But it is what I am hoping to start doing now… to pay for those ‘gift’ quilts! Do you buy bolts of fabric? I am having a hard time figuring out how I will profit from making the quilts with most fabric being $8-$9/yd. May be a silly question, just though I’d ask!